I specifically chose the case for my new home server for its internal bays (7x 3.5″) and its external dimensions, as it has to fit on the same closet shelf as my old Microserver N36L. 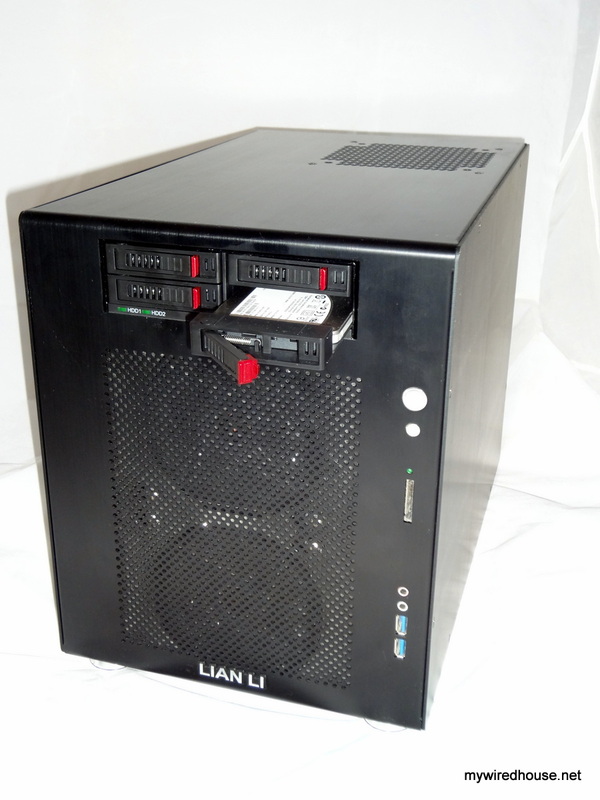 I ended up choosing the Lian-Li PC-V354b Case which is working out great for me. More on that in another post however, as its not why I’m writing right now. The important point to note about this particular case is it has one 5.25″ external drive bay, and 7 (yes, seven, in a mATX case!) 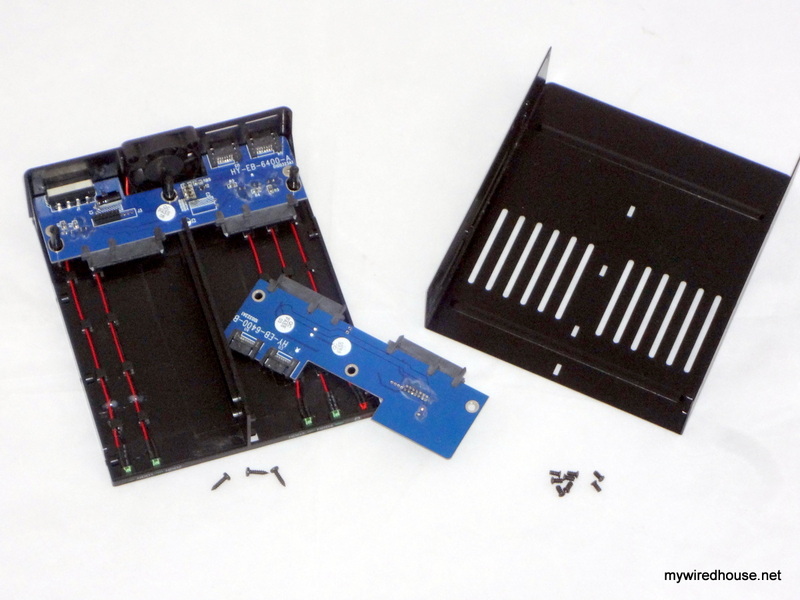 internal 3.5″ drive bays. 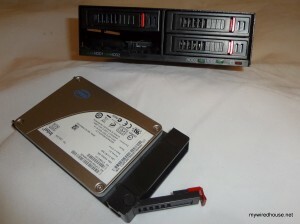 My new server is running a virtualised environment with a couple of RAID1 pairs for the OS and virtual machine drives, and I wanted to use the 3.5″ bays for NAS storage, so I wanted to find a solution which let me put four 2.5″ drives into the single 5.25″ bay, and still be front-accessible, because I have a tendency to tinker and swap drives/OS’es when experimenting. The drive cage itself with 4 trays, and exactly the right number of screws to attach the drives to each tray – no spares! 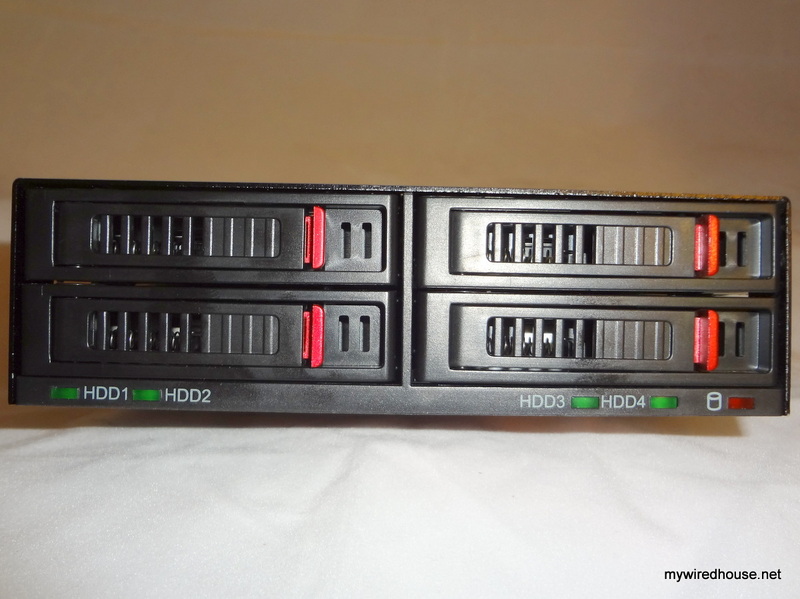 Its worth noting this isn’t my first 2.5″ bay adapter rodeo.. I’ve been rocking a Thermaltake Max4 hdd rack in my desktop for a few years and find it really handy. Anyway – here’s close-ups of the front and rear of the Vantec unit, before I decide to (un)screw the warranty and take it apart. 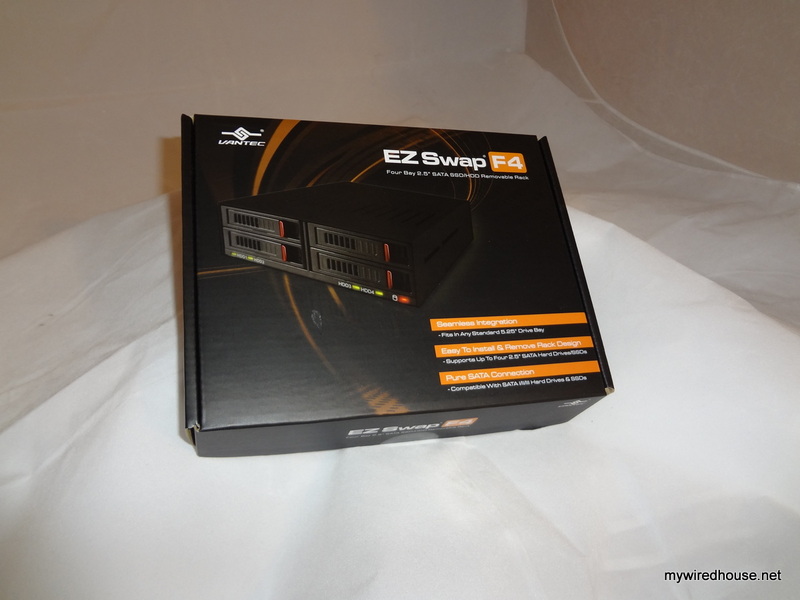 Four 2.5″ drives into a single 5.25″ bay. Cosy! As you’ll notice, four SATA ports is going to give rise to an issue, especially in a small(ish) micro-ATX case. Yeah, cable clutter.. something I try to avoid a bit, although I’m not anally retentive about it like some posters on various forums, who seem to not actually want cables in their PC’s. I’m getting ahead of myself for now however. Cheap plastic parts get more solid when you screw metal stuff to them.. who’da thunk? So I screwed one of the drives from my soon-to-be Server onto a plastic tray – actually the drive made the tray feel a lot more solid! Encouraged by this, I quickly screwed more drives onto trays, and decided to go for a test drive [sic]. 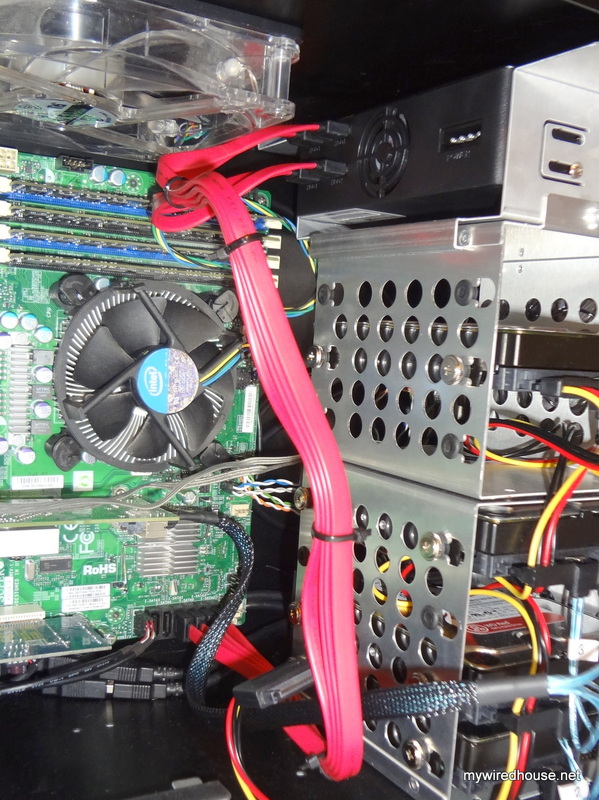 So I wiggled it into the external bay on my case where I’ve been testing various components while building the server, and plugged in the bits on the rear. Here’s what I did about the cable clutter issue – elegant (cough! ), and cheap (win! ), and it doesn’t disrupt airflow in the case too much. The downside to four separate SATA ports on the rear is needing four cables to it. But hey, why do you think they call them “cable ties”? I powered it up, and the first thing I notice is that someone’s installed a small jet engine in my carefully crafted noise-free server! So in operation, it all works as expected – the LED’s on the front are there to tell you which bays have disks in them, and nothing more – no activity lights or anything else fancy. I guess if I’d paid the $100 for the Supermicro I’d have got something fancier.. or possibly just more (any?) metal for my money. 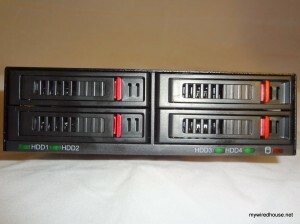 The drives slide in and out fairly easily, and lock into place well, so you can’t shake them out the front of the server. Confirmed.. its flimsy. Even better, the fan is easily removed. It works.. that’s good, because now I know that I don’t need to RMA it as its not broken (just yet), I can move on to dis-assembly and seeing if I can do something about that fan. One small pointy Philips screwdriver later, and I had the thing in pieces. Mrs Wired saw me sitting on the floor with the pile of screws and laughed.. “Didn’t you just get that?”. 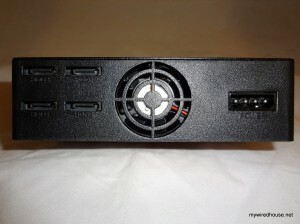 So it comes apart very easily – the fan is a two-pin 40mm x 10mm one, with a short lead. It has the part number A4010L12S on it – which judging by this spec sheet, runs at 4k rpms and 25 deciBels, and despite all the noise, moves about 3CFM. I have some ideas on that, but I need to do some research (yay! who doesn’t love research?!) before buying a better fan and testing it out. So after all that, I stuck it back together (no screws left over!) and installed it back in my server for use testing bits (I’m regression testing the server – making sure the NICs, drive controllers, memory, motherboard etc. all play nice together and software drivers work as they should in various virtual machiens). And lastly, here’s a pic of the front of the server.. cuddly! 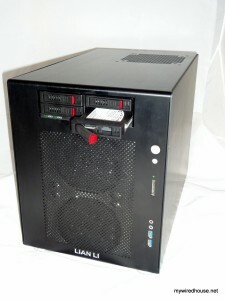 Lian-Li PC-V354b with Vantec EZ Swap F4 drive bay adapter in it. Did I mention its cheap? I’m happy with it – it’s functional, fits my needs, and for another $8 I should be able to fix the noise and keep my server below the audible threshold when its in the closet. For the “cheapest on the market” of the various alternatives I could find, its great, and I’d recommend it to anyone who wants to cram 2.5″ drives into a 5.25″ bay.